I’m looking to put 1-2 air cleaners in my 20×22 shop or 440 square ft. What I’m looking for is a decibel level (available free apps for phones and tablets) for either the jet or winn. I’m surprised with all the reviews on tools that no one provides the decibel level. Everyone says the Jet is loud and the winn is quiet. I know apps and the technology isn’t perfect, but they give you a good idea. When I bought my Jet dust collector the manufacturer stated the decibel rating and it was very close to what my app said. So I’m not set on these two and if you’re willing to check it, I’m interested. Please check about 6’ away so we’re comparing apples to apples. What app are you using? I have a WEN, to me it is quiet but quiet is a relative term.. Interesting request. I have the dB Meter IOS app and a Jet Air Filtration System. From around 6 ft from the exhaust side, the dB ranged between 60 and 63 for the three speeds. Thanks Rich I appreciate it. Wood, my app on my tablet is just called “Noise Meter” it’s free and there’s many free apps available for all devices. If someone could please check the WEN I would appreciate it. There is more to this than the noise level at the three speeds. First, I thought I would add a data point. I have the Jet and it is suspended from the joists in my unfinished basement. I haven’t done anything to try reducing the noise level. The three speeds gave readings of 55, 61, and 63 decibels at about six feet like the tests above. The Jet owner’s manual gives sound rating levels of 62, 67, and 69 decibels, measured at three feet. Unless there is another, much larger WEN model it is easy to see why it would be quieter. The Jet moves more air at the low setting than the WEN at the high setting at the same noise level. Three WEN filters all running at 350 cfm would probably be a lot louder than the Jet on the 1044 cfm setting, while moving the same amount of air. Is there a WEN air filter I couldn’t find? Got the app, mine reads 57 low 59 medium and 62 at high speeds. Checked from 6ft away. Filters were last changed 3 months ago, normal WEN filters nothing fancy. My shop is 16×20. 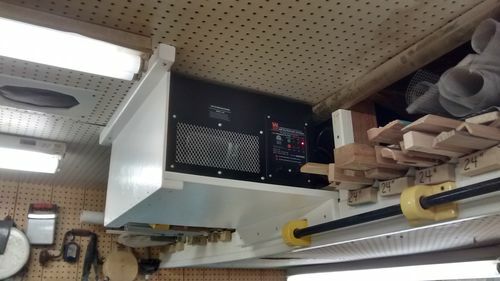 I have a JDS high efficiency air filter hung from the ceiling in my shop. I cannot hear it running over the music playing most of the time I’m in the shop. It is the quietest thing in the shop except maybe for my makita sharpener or one of the low speed grinders. Most of the noise is from air movement, not the device itself. Unfortunately DB rating and or how much air it moves isn’t the real issue,you should not to have dust in the air in the first place, it’s much better to collect it at the source than to have it floating around the room to be collected after the fact. Unfortunately DB rating and or how much air it moves isn t the real issue,you should not to have dust in the air in the first place, it s much better to collect it at the source than to have it floating around the room to be collected after the fact. Unless you’re Festool equipped at every station and have HEPA filtering, no DC solution is thorough enough not to warrant an overhead filter.